There are various other items which I consider essential, but I decided to split my carry up into sets based on where I carry them. These are the things I always have on me, both indoors and outdoors. 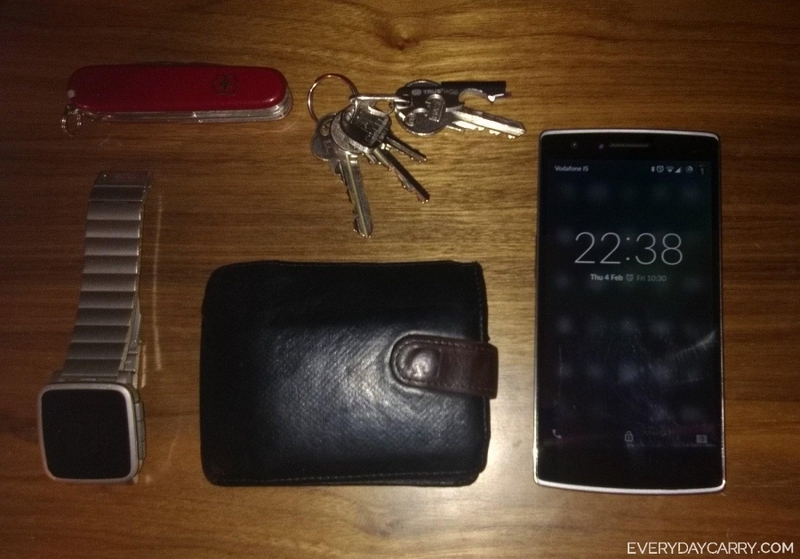 Apart from the watch, they are kept in my trouser pockets. The next set I will post will include the things I carry whenever outdoors, kept in my coat pockets. A third set will complete the series, featuring my university/office/travel carry, which are larger and less essential items kept in a messenger bag. I don't see any need for a separate knife, the one on the Fieldmaster (which I chose specifically from the Victorinox lineup for its particular set of tools) is quite enough for everything I need to cut. Love the fact that you use a Pebble! I wasn't 100% sure I'd want to wear it when I backed their kickstarter, and was prepared to sell it again if I ended up not liking it... but it grew on me really fast. I'm not interested in all the features of an AndroidWear smartwatch, but being able to see notifications, read messages and change the music from my wrist is really handy so I'm keeping it. The battery life is great, needs charging about every 10 days and takes only a couple of hours.